‘America’ as she appeared in 1851. ‘Sverige’ Schooner, 280 tons. Built in 1852 in Sweden. The America still figures largely in the racing annals of the time, though her owner was Lord de Blaquière, and on occasions she was handsomely beaten. The first defeat was at Ryde Regatta in the match for Her Majesty’s Cup, when she was beaten by both Arrow and Mosquito in a race round the Isle of Wight. Mr. Underwood, the pilot, who was aboard her in the famous victory of 1851, was also on board on this occasion. The victory of the two British boats greatly rejoiced the hearts of home yachtsmen, and though America’s owner protested that the British boats fouled – a protest which was substantiated and in consequence of which Arrow was awarded the cup – the national vindication was no less appreciated. Another occasion on which the American schooner was defeated was that of the race between her and the Swedish schooner Sverige for £100, starting from Ryde Pier. This race caused a long controversy on the interpretation of the clause in the agreement which stipulated that a condition of starting should be a seven-knot breeze. With the schooners started the small cutter Wildfire, 48 tons T.M., owned by Mr. Frederick Thynne, though the latter boat was not included in the race. The America beat the Swedish yacht, but, strangely enough, the little cutter beat both on every point of sailing, and reached the mark-boat 7 minutes 1 second ahead of Sverige and 15 minutes 27 seconds ahead of America. ‘Arrow’. Built by Mr. Thomas Chamberlayne in 1825. Although these events had become the subject of much controversy and useless comparison, with challenges and other incidentals likely to arouse the interest of the public, the sport was equally progressive in other quarters. Volante, a smart cutter, was capturing flags at most of the regattas, her sporting owner, Mr. J. Craigie, entering her against anything and everything of reasonable size. On the Thames enthusiasm had grown enormously, and it was not unusual for a Royal Thames Yacht Club match to be followed by a club steamer carrying two or three hundred enthusiasts. The sport, too, was worthy of the enthusiasm evinced. On May 14 the match for the Grand Challenge Cup, value 200 guineas, was sailed. Six boats entered, including Cygnet, Mosquito, and Volante, which had been victorious in 1849, 1850, and 1851 respectively, and the two boats Paulina and War Hawk. The latter boat was a dangerous rival and sailed magnificently, but came into collision with Mosquito, and Volante carried off the cup. The Thames was, in a broad sense, the popular rendezvous of racing, the three important clubs – the Royal Thames, the Royal London, and the Prince of Wales – sailing all their matches here; but in the Western Regatta at Plymouth Mosquito and Volante sailed a fine race, the former winning by 3¼ minutes, and occupying only 4 hours 18 minutes over a fifty-mile course. There was a hard breeze, and both yachts sailed with housed topmasts and reefed mainsails. At Cork the Eglinton Cup was sailed for by nine cutters, and won by Mr. Rowan’s 43-ton Aquila, and the Egmont Cup was won by Mr. Scovell’s Atalanta, Mr. Daunt’s 23-ton cutter Champion being disqualified for not carrying a large enough boat. At the same regatta on July 30 the Queen’s ‘plate’ was won by Mr. Lang’s Stella (42 tons). ‘Gloriana’. Rounding the Neb Light in the Royal Yacht Squadron Match for H. R. H. Prince Albert’s Cup, August 19, 1852. Cowes, in the fifties, was not the brilliant function of the present time, though the Queen’s presence gave importance to the occasion. The Vice-Commodore’s (Mr. T. Chamberlayne) yacht Arrow com­peted against Lavrock and Aurora for the Queen’s Cup, Arrow being the winner. For Prince Albert’s Cup, value £50, four big schooners competed, and Gloriana carried off the cup. Owing to want of wind the match for the Squadron Cup was resailed, and Mosquito was winner. It was a course round the island, and the breeze fell away as the day wore on, and the race was not finished till 10.11 p.m. Mosquito thus won in the moonlight, followed by Arrow, but the other competitors did not arrive till the next morning. The Irish regattas were attended with success by many of the English boats. Stella won the Royal St. George’s Cup, Cynthia the Lord Lieutenant’s prize, and Atalanta the Queen’s Cup. The Prince of Wales Club opened the season of 1853 on March 24.. It was a wintry day, and nothing but sheer enthusiasm could have brought out the fleet at Blackwall. However, a fleet did turn out for a cruise to Erith, and a snow-storm was one of the discomforting features of the sail, though an excellent dinner at the Erith Station comforted the frozen yachtsmen on their arrival. The first racing on the Thames fell to the. Royal Thames Yacht Club on May 3, when Lord Londesborough’s Mosquito carried off the £100 prize for a match of first-class yachts exceeding 30 tons, and Mr. S. Lane’s Phantom carried off the £50 prize for second-class yachts. The Royal London started on the 18th, when Julia, Truant, and Calliope won in the three classes. Truant was an American clipper, the first ever sailed on the Thames. She was fitted with a centre-board sliding-keel, an arrangement which did not meet with the approval of British yachtsmen, who held that she might as well be called a yacht as a match-cart a comfortable family carriage. She was built wholly for speed, and she was the first home by twenty-three minutes, a victory which caused much heart-burning. 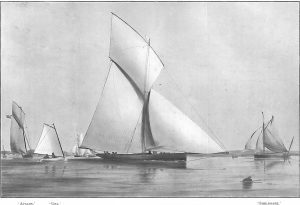 The schooner match of the Royal Thames Club, for which the Vestal, Rosalind, May-Fly, Sverige, Violet, and Sappho were entered, was a magnificent race, but it ended in a protest and law proceedings. The contest proper was between Sverige and Rosalind, which sailed for a long time neck and neck. Sverige, however, got her gun 1 minute 35 seconds ahead. The protest arose from Captain Freestun, the owner of Violet, who protested against Sverige for foul sailing. Mr. Bartlett, the owner of the Swedish boat, made a counter allegation against Violet that she had been let for hire, and had therefore ceased to belong to the club. As no ground was found for this counter-stroke, and the protest being upheld, Sverige was deprived of her victory, and Rosalind, owned by Lord Alfred Paget, the Commodore of the club, became the winner. A long and bitter fight between Mr. Thomas Bartlett and the Sailing Committee of the Royal Thames ensued. The weather throughout the season was unusually boisterous. The majority of the Thames matches were sailed in rain-storms. At Harwich, a little later, the regatta of the Royal Harwich Yacht Club was spoiled by rain, and many yachts being wind-bound, the chief races were postponed. Lowestoft Regatta was far more successful, and attracted the big schooners from 30 to 300 tons for the 100-guinea prize. There was no handicap, and the great Sverige was entered against the little Gossamer of 25 tons. How­ever, Mr. Bartlett decided to withdraw his boat, and Mosquito became the prize-winner. ‘Sverige’, 280 tons. Winning the Royal Thames Match, June 1, 1853. Winner of the 100-Guinea Cup at Cork, 1853. Brighton Regatta was one of the most brilliant events of the year, with a schooner match for 120 guineas. Only Sverige and Alarm (Mr. J. Weld) were entered. Alarm, being the most cele­brated boat of the time, and Sverige the centre of immense interest, added to the public interest in the race. The Swedish boat led off, but Alarm quickly overhauled her, and led to the finish, over a 52-mile course, though she finished with but two minutes in hand. The whole distance was covered in 4 hours 20 minutes. The Arrow, Wildfire, and Aurora competed for the hotel-keepers’ prize of £100, Arrow winning by seventeen minutes. 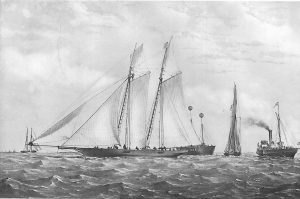 The Swedish schooner Aurora Borealis also arrived in the Solent for the Squadron Regatta, and a private match between her and Mr. Joseph Weld’s schooner Alarm round the Isle of Wight was one of the events of the season, Alarm sailing a magnificent race and finishing two minutes ahead of the Swede. The Squadron matches resulted as follows: H.R.H. Prince Albert’s Cup won by Lord Londesborough’s Mosquito; Her Majesty’s Cup, over the Queen’s course, by Mr. Joseph Gee’s Gloriana; the Squadron Cup by Mr. William Peareth’s Julia. The Americans were at a loss to explain the defeat of their favourite, and Sylvie’s owner offered to back her to sail for any amount, but the challenge was never accepted. The Swedish yacht appeared at the Royal Yorkshire Yacht Club Regatta earlier in the season, and competed for the Queen’s prize against five yachts whose aggregate tonnage was only 195 tons against the Swedish boat’s 250 tons. 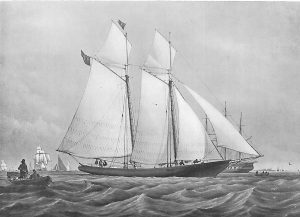 The Aquiline, a 55-ton schooner, owned by John Cardinall, made the best fight, but she was forced aground, and the Swede had the finish to herself. 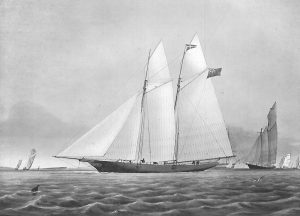 Sverige turned up at the Royal Cork Regatta, and beat Isidore and Gitana in the race for schooners for a trophy of £100; but here again it was an uneven match, her tonnage being twelve over the combined tonnage of her two competitors. Lord Londesborough’s iron-built Mosquito was a successful boat throughout the year, and the most successful prize-winner. Volante, which had shown such good form in the previous season, was also successful as a prize-winner, and Phantom sailed in a creditable manner. The Crimean War had a serious effect upon the racing of the season of 1854. So many owners were engaged in the Services that but a small proportion of yachts fitted out, and many of the regattas were postponed, making a falling off of £1,000 in the prize value for the year. There was, besides, very little cruising in foreign waters. Alarm, Arrow, Osprey, Phantom, Volante, Thought, and several other of the well-known racers made their appearance, and Phantom was one of the biggest prize-winners of the year. It would be idle to deny the fact that the season suffered to an almost unprecedented extent. On the Thames there was no schooner match, and the entries for the matches of the Royal London Club were not up to the usual standard. On the East Coast racing was more interesting, with a larger attendance of yachts. At Lowestoft thirty-three boats were about the station for the regatta, and the race for schooner yachts for a piece of plate value 100 guineas was the most brilliant ever seen on that part of the coast. Shark, Acorn, Aquiline, Georgiana, and Mayfly competed, and Shark, after a splendid fight, won by eleven minutes. At Harwich the attendance was large, and the match for yachts of any rig or tonnage for a piece of plate value 50 guineas was won by Phantom, whilst Avalon won the race for a 30-guinea piece of plate. At the Royal Mersey Regatta, Coralie, cutter, owned by Mr. A. E. Byrne, which in the previous year won the Queen’s Cup, was the winner of the challenge cup. Coralie also won the purse and £40 at the Royal Irish Regatta, but was beaten by Cymba and Wildfire for the Royal Irish prize of £100. At the Royal Western (Ireland) Regatta, Cymba, owned by Mr. J. M. Rowan, and manned by Corinthians, won the £100 prize, and Viola the Corinthian Cup. On the South Coast the racing was of more general interest. The match for schooners at the Royal Southern Regatta was won by Elizabeth, and for cutters by Arrow. Vesper won the match for cutters not exceeding 20 tons, as well as the Vice-Commodore’s Cup. At the Royal Victoria Regatta Arrow carried off the silver salver and a purse of £75, although the weather was by no means favourable. These events, as usual, preceded the Royal Yacht Squadron Regatta, which spread itself over seven days. Julia and Arrow were the centre of an interesting match for H.R.H. Prince Albert’s Cup, sailed over the Queen’s course. Besides these two boats, Osprey and Arrow were also entered, and, after a magnificent contest, Arrow won the cup by fourteen minutes. Alarm and Shark were the two antagonists in the Queen’s Cup match, though Ginevra and Titania were also entered, but an absence of wind compelled a resail. This was fixed for the following Monday, but a most unfortunate thing happened the crew of the Alarm put up an effigy of a gamecock from her bowsprit end, which was deemed insulting to her com­petitors, who severally withdrew, leaving Alarm to sail the course by herself and claim the cup. The incident was most unfavourably interpreted, though it may be attributed to nonsensical display on the part of the crew. Mr. Weld, the owner of Alarm, was ashore at the time. This finished the racing in the Solent, and left a somewhat unfortunate impression. Cymba and Coralie were contestants at the Royal Northern Regatta, when Cymba carried off a silver vase value 70 guineas and Coralie a silver jug value 30 guineas. Coralie was again successful in the Royal Welsh Yacht Club Regatta, winning the Carnarvon Cup against Ada and Hirnant. The Prince of Wales’s Cup was won by Siren. Altogether the year was a disappointing one. The best prize-winners were Cymba, Phantom, and Arrow. Cymba was built in 1852 by Will Fife of Fairlie, and was an out-and-out fast craft, and from her launch won everything she started for. She captured trophies at the Royal Irish Regatta, the Royal St. George’s Regatta, the Royal Irish Yacht Club matches, the Grand Corinthian Plate, the cup at the Dunoon and Kirn Regatta, and a 70-guinea vase at the Royal Northern Yacht Club Regatta at Largs. The principal dimensions of the Cymba were: Length O.A., 55 feet 6 inches; breadth, 15 feet 3 inches; draft (aft), 10 feet; draft (forward), 5 feet 6 inches. The length of her keel was 52 feet, and she was the most completely fitted of any yacht of her day. Whether war did or did not adversely affect the sport of the years 1854 and 1855 was a question keenly debated by yachtsmen. Contemporary history confirms the contention that it did. And certainly the two years were quiet ones. The sailing and seamanship of the year were, however, above the average, and some of the finishes were of almost unprecedented interest. The Glance, owned by Captain Bartlett, showed wonderful form at the Royal Welsh Yacht Club Regatta at Carnarvon, when she won the 50-guinea prize in a gale of wind and tremendous sea. She had an excellent crew composed of some of the best sailors of the day, and carried a heavy spread of canvas. Another close finish after an exciting match was that on the Thames for a prize offered by the Royal London Yacht Club, the result of which was that the 7-ton cutter Julia beat the 10-ton cutter Romp by one second. Original cutter, ‘Phantom’, 25 tons. Formerly owned by Mr. Chas. A. Jones. Also showing ‘Avalon’, ‘Una’ and ‘Sheldrake’. In the matches on the Thames Phantom showed good form, winning the first-class prize, although only entered for the second class. Thought, which in the preceding year showed prize­winning qualities, was beaten by both Phantom and Marina on the Thames, and Amazon, Glance, Marina, and Phantom all beat her at Harwich Regatta. At the latter regatta Amazon won the laurels in the match for cutters with a margin of fifteen minutes. Her other wins were at the Royal Cork Regatta, Boulogne Regatta, Dover Regatta, and Antwerp Regatta. At Antwerp she won £125, beating Thought and Nymph. Two new yachts were entered for competition in the Prince of Wales’s Yacht Club matches. They were Violet, 9 tons, owned by Mr. J. R. Kirby, and built by Aldous, of Brightlingsea, and the Veritas, belonging to Mr. Baxter. Violet was among the compet­ing yachts at the Royal Thames Club match, and she completely worked to windward of the whole fleet, beating them by a mile in an hour’s sailing. She was favoured by a stiff breeze on that occasion, but when racing in the Royal London match she was not so fortunate, and Kitten was the winner, and Julia and Little Mosquito were winners of the two second-class prizes. The Veritas as a racing boat finally proved a failure. The Royal Yacht Squadron matches were almost entirely devoid of interest. For the Prince Consort’s Cup Shark, Claymore, Cecile, and Glorianawere entered, but Cecile was withdrawn on account of a serious accident to one of her owner’s daughters. The other three were at the starting-buoy. When the starting-gun was fired Shark and Claymore hauled down their racing-flags, to the intense surprise of the spectators, and Gloriana had a walk-over. The cause of the sudden withdrawal of the two yachts was due to some misunder­standing as to the direction of the course. The Squadron Cup was won by Alarm, and Her Majesty’s Cup by Bacchante. Her Majesty the Queen and the Royal Family were present at the regatta. Two years of comparative depression were followed by a year of healthy sport, and 1856 saw a revival of the enthusiasm and a return of many of those yachtsmen whose duty had called them abroad. Most of the yacht-owners put their vessels in commission, and the racing fixtures filled well. The schooner match on the Thames was revived, and the Squadron Regatta assumed all its historic grandeur. New boats, too, made their appearance in English and Irish waters. Glance, the 25-ton cutter owned by Captain Bartlett, which distinguished herself in the preceding year, was the champion of 1856, and the amount of her winnings (£542) exceeded that of any yacht on record. She was built by Hatcher of Southampton, and won the Royal Yacht Squadron 100 sovereigns, and trophies at the Royal Cork, the Royal Southern, the Royal St. George’s, Poole, Lowestoft, Grimsby, Torbay, and Teignmouth Regattas. The Surprise, owned by Mr. T. Tetley, was her most dangerous rival, and captured prizes to the value of £405. She was built by Hansen. The revival of the Thames schooner match brought together Lalla Rookh, Wildfire, Vestal, Sappho, and Aquiline. The Aquiline had already distinguished herself, and in the squally weather carried her topsail without inconvenience; but she proved a failure, and Wildfire, sailed recklessly in the heavy wind, was declared winner on time, though Lalla Rookh got her gun five minutes ahead of her. Cymba, the fast and invincible cutter, was raced extensively in Irish waters, her chief and highly successful opponent being the Glance. At the regatta of the Royal St. George’s Yacht Club for a purse of 100 sovereigns Glance, Cymba, Cyclone, Secret, Coralie, Vigilant, and Victoria were competing. Glance was sailed to her utmost capacity, and the handicap on Cymba gave to Glance the prize. On the following day they were again in conflict, with an almost similar result, though Glance this time reduced the bigger boat’s lead by two minutes. Cymba was again defeated in the Grand Corinthian Cup match in connection with the Royal Western of Ireland Club, and Vigilant won the second-class Corinthian Cup. Surprise, owned by Mr. T. W. Tetley, and built by Hansen, was the second best yacht of the year. Sailing against such champions as Cymba and Coralie, she again won the Mersey Grand Challenge Cup, value £140, which now became her property. She was also a winner at the Royal St. George and the Royal Welsh Regattas, Holyhead and Swansea. Most of the Royal Yacht Squadron matches in the Solent were favoured with splendid sailing weather, especially on the Queen’s Cup day, and for the Queen’s prize Lalla Rookh, Gloriana, Urania, and Viking competed, Gloriana as usual doing her owner credit, and for the third time carried off the trophy. The Prince Consort’s Cup was won by Extravaganza, and the Squadron prize of £100 was won by Glance. Both these matches were sailed in light airs. Glance was again winner the following day in the Royal Southern schooner match. One of the most exciting events of the season was the Royal Victoria schooner match, in which Arrow and Mosquito were the only competitors. It was blowing half a gale, with a heavy sea, when they started, and both smoked along at a record pace, till suddenly Arrow’s mast, sails, and rigging went overboard without warning, and Mosquito went to her assistance, taking her in tow. Under the peculiar circumstances the prize was awarded to Mosquito. On the following day Thought won the Commodore and Vice-Commodore’s Cup. The schooner match for the club prize brought about a curious protest. The Maraquita led over the course with half an hour in hand. At the end of the race, however, Captain Thellusson, the owner of Georgiana, entered a protest on the ground that the winning boat had topped her boom before the starting-gun was fired, and on this protest the committee disqualified the winner from receiving the cup. The Queen’s Cup of the Royal Victoria Yacht Club was sailed in half a gale of wind, and made a magnificent spectacle as Maraquita, Georgiana, Extravaganza, Zouave, Whirlwind, and Benita were driven through the heavy seas. Maraquita retrieved her unfortunate loss of the previous day, and won the cup with half an hour in hand. Two new yachts built by Fife made their appearance at the Royal Northern Regatta in the 60 guinea plate match. They were the Oithona (80 tons) and the Crusader (30 tons), and the first-named yacht succeeded in capturing the plate. At Dunoon, for the Dunoon Cup, value £60, the Crusader had her turn, and beat all her rivals, though she did not complete the course within the stipulated time. At Greenock, for the Corinthian Cup, Crusader was again victorious. It may be interesting at this period of the history of yacht-racing to put before the reader some figures showing the great increase in the pleasure fleet of the United Kingdom. It was an increasing navy of some power and utility in war, aggregating 780 vessels. We find that there were 511 cutters, 138 schooners, 19 steam-yachts, 75 yawls, and 37 vessels of other rigs, the estimated tonnage of this fleet being 30,000. Though, compared with the enormous tonnage of the present day, these figures are small, yet they were of the greatest significance at the period with which we are dealing, for no country could show such a fine fleet of ships or such splendid sailors as their crews. The success or otherwise of a season’s racing is governed by the weather. The preceding season was notorious for its uncon­geniality. The season of 1857 was notoriously calm, and in each race on the Thames all canvas was carried. ‘Silver Star’, 40-tonner. Designed by Mr. A. Richardson and raced by Mr. W. Pilkington. Emmet, built by Wanhill of Poole, was one of the new vessels of the year. She was a long, sharp vessel, and to the experts of the period looked the ideal racer; but she was not successful, winning once only out of five starts. Silver Star, built in 1856 by Tovall of Colchester, was of a similar type, and was also un­successful as a racer. Amazon, which appears conspicuous in the racing annals of other years, was not raced, owing to the death of her owner, Mr. A. J. Young. Lulworth, built by Inman for Mr. Joseph Weld, again appeared this year. She had been altered in her rig and reduced in spars. The change was successful, for she crowned herself with glory by beating the famous clipper Arrow at the Royal Victoria Yacht Club Regatta. She won the Queen’s Cup at the Royal Yacht Squadron Regatta, and prizes at Torbay and Wey­mouth. Another successful new yacht was Ethel, 15 tons, built by Moore, and owned by Mr. H. E. Bayley. She won four out of six matches in which she was engaged. Northern Star, owned by Mr. G. Harrison, was another new and successful boat. The largest prize-winner of the year was Wildfire, which main­tained a character for speed. She made ten starts, and won five prizes amounting to £302. She was beaten by Lulworth twice, Vestal once, and Mosquito once. Mosquito made eight starts, but captured only three prizes. On the Thames cutter matches and the annual schooner match were held. For the latter Zouave, 90 tons (Mr. Arabin), and Mayfly, 113 tons (Mr. Bidder), were entered for the £100 prize for schooners over 75 tons, and Aquiline, 64 tons (Mr. Cardinal), Wildfire, 6o tons (Mr. Turner), and Vestal, 74 tons (Mr. Marshall), for the match for schooners under 75 tons. Zouave was a perfectly new craft launched from Inman’s yard at Lymington quite a short time before the race, and, though a fine roomy vessel, with plenty of accommodation, she proved victorious over Wildfire, though the little Vestal received her gun ahead of either, and took the second-class prize. Little Mosquito was again very successful on the Thames. She was built by Hatcher, and in her first year on the Thames won everything she sailed for. She was short, with an immense beam, and very fast, and in the first match of the season under review she won the Prince of Wales’s Yacht Club Cup, value 35 guineas. Her winnings for the year amounted to £126. The Squadron Regatta was not too successful, and the purse presented by the club was reduced to 50 guineas; and, finally, the restrictions were such that Wildfire and Vestal, the only two boats entered, hauled down their racing-flags and left for Ryde. The misunderstanding arose through the introduction of new regulations for measurement. The race was announced to be sailed on time, and under the Squadron rule Lulworth’stonnage would have worked out at 110 and Wildfire 77 tons. There were rumours that the committee would not make known the time allowances till the race was in progress. This untoward incident closed the Squadron week, in which the Prince Consort’s Cup was won by Lalla Rookh and the Queen’s Cup by Lulworth. A private match between Fancy Lancashire Witch, Eugenie, and Cecile, the big schooners, was won by Cecile. The Royal Victoria Yacht Club Regatta brought together all the famous racing cutters and schooners, and there were thirteen boats entered for the subscription prize of £100, open to all yachts. The race was exciting, and it was in this match that Lulworth made her great victory over Arrow on even terms. The Arrow, however, captured the silver cup on the following day. Lulworth’s victories of the season of 1857 were repeated in 1858, though the amount won was not so large. Mosquito, owned by Mr. T. Groves, was the champion boat of the year. She captured prizes at the Royal Cork, Royal St. George’s, and Royal Western of England Regattas, racing against Dream, Extravaganza, Amazon, Glance, etc. Vigilant and Ursuline were about equally successful. The season opened on May 8 on the Thames. The number of matches sailed during the year was 100; the prizes amounted in cash to £3,896, of which sum the royal clubs contributed £2,515. The racing of the season was of an uneventful character. The Royal Thames Club held cutter matches, but the annual schooner match again fell through, to the intense disgust of all concerned. The intended match had been much talked of, and great expecta­tions centred around it. A deficiency of entries, however, led to its abandonment. The reason assigned was that Wildfire was the first boat entered, and that fright deterred other owners from entering. 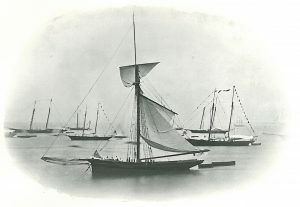 The second, third, and fourth classes on the Thames raced with good entries, and Pearl, 21 tons, Vampire, 20 tons, and Emily, 8 tons, were the respective winners. Little Mosquito’s season on the Thames was a brief one. She had swept everything before her in the previous year, and was in excellent trim, when on July 25 she was destroyed in the immense fire at Acorn Wharf, Rotherhithe, where she was lying. An excellent schooner match was sailed at Kingstown in connection with the Royal St. George’s Regatta. By an arrangement between this club and the Royal Irish Yacht Club the management of the regatta was alternated between them, and both contributed to a prize fund. The match for the purse of 100 sovereigns saw one of the best gatherings of the season, including the three schooners Wildfire, Oithona, and Maraquita, and the five cutters Cymba, Surge, Mosquito, Dream, and Amazon. After a false start and amid much excitement the boats were restarted, and Mosquito, though receiving her gun first, was beaten by Surge with 2 minutes 13 seconds to spare. The course was 48 nautical miles, and the average speed of the winner was 8¼ knots. The Surge was an entirely new creation by Fife of Fairlie, and had only been launched three weeks previous to this, her maiden race. Extravaganza and Fair Rosamund were entered, but not timed. Ursuline was not quite 41 minutes behind Alarm, and 17 minutes behind Claymore. From the former she received 481 minutes, and from the latter I9„ and she was therefore the winner. Claymore was also within her time of the Alarm, and worked off the 70 miles at the average speed of 122 miles per hour. The race was excel­lently sailed by all the yachts. At Ryde the Lulworth was winner in the Royal Victoria match for a piece of plate value £100 against ten other cutters and schooners, and for the big schooner match prize Constance, owned by Mr. J. Turner, was the winner. It had become fashionable among designers and builders to remodel existing yachts, and increase the length forward in order to gain additional speed. A typical example of this experiment was the 255-ton schooner Constance. Her keel was laid down by White in 1848-1849 for the Marquis of Donegal. She remained for some time in frame, and was purchased by the Marquis of Conyngham, and launched in 1850. She then measured 218 tons. The new type arising from the America’s victory in 1851 brought about the wholesale alterations of yachts, and Constance was among them. Her bow was lengthened by 11 feet, thus bringing her up to 254 tons. Another schooner altered in the same way was Wildfire, built in 1849 by Hansen of Cowes. Originally she was cutter-rigged, but in 1851 and 1853 she was lengthened and rigged as a schooner. She was purchased by Mr. J. Turner-Turner, and up to 1858 was a successful prize-winner. In that year she did not add a single item to her previous winnings, though in the following year (1859) she was entirely successful. Lulworth was originally rigged as a sloop, but was subsequently altered to a cutter. New yachts making their appearance in 1859 were Aura, Storm, and Scourge. The first-named was built by Wanhill of Poole for Mr. W. H. M. Ellis. She was a cutter of 45 tons, and beat all her opponents in every race by actually coming in first. At the Royal Cork Regatta, Royal Northern, and Royal Irish she was invincible, and her winnings for the whole year amounted to £500. Neither Storm nor Scourge were successful racers. Wildfire, which did not win a single prize in the previous year, was the second-best boat. She was, as we have seen, altered from cutter to schooner rig. She won prizes to the value of £288, and showed excellent form. 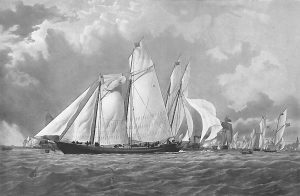 Osprey, a 59-ton cutter owned by Colonel Ifney, appeared as a racing craft, and succeeded at the Royal Thames match in beating Mosquito and Amazon, the former by 13 minutes and the latter by 35 minutes. Out of six starts she won seven prizes. Mr. T. Bartlett was at this time the owner of a new clipper, the Haidee, an 8-ton cutter, built by Hatcher of Southampton. Haidee’s first match was sailed at the end of July at the Prince of Wales’s Yacht Club matches against Wildfire, Emily, and Midge, and she proved herself to be an easy winner, beating Wildfire by 14 minutes. Though starting late in the season, she was able to win for her owner £123. Another new craft was Sybil, built by Wheeler of Cork for Mr. John Arnott, M.P. She was a cutter of 39 tons, and though she was declared successful as a racer, she only won two out of six starts. On the occasion of her first race she was steered out of her course in the fog. The racing of the year was more successful than it had been for many years previously. 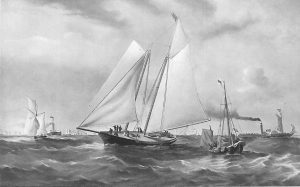 Four schooners – Alarm, Zouave, Vestal, and Destiny – were entered for the Royal Thames schooner match, but Mr. Weld’s fine schooner Alarm won the race with almost an hour in hand. The actual times were: Alarm, 5 hours 47 minutes; Zouave, 6 hours 40 minutes; Vestal, 6 hours 51 minutes. The Squadron Regatta was also well attended, and an interesting bit of American architecture in the shape of Sir Henry Beecher’s new schooner, Magnolia, made her appearance. She showed to very poor advantage, as she had done previously at Cork, chiefly owing, it was believed, to her having been Anglo-Americanized. The Prince Consort’s Cup, for which this new schooner was also entered, was won by Zouave; Cecile carried off second prize. Her Majesty’s Cup for cutters and yawls was won by Brunette (Colonel Simmons Smith). The Squadron prize was won by Alarm (Mr. Joseph Weld); but Wildfire’sowner, Mr. J. Turner-Turner, protested against Alarm on the ground that she had set her jib topsail, and the Sailing Committee upholding the protest, the prize was awarded to Wildfire. The arbitrary action of the Lord Commissioner of the Admiralty in ordering the discontinuance of the St. George’s Ensign by the Royal Western Yacht Club of Ireland produced a bad effect among yachtsmen outside the Squadron. The honour of wearing the white ensign as a device was granted to the Royal Western Yacht Club by King William IV., and though the Admiralty complained that the privilege had been abused, they also added the additional excuse that two other clubs had made application for that flag, and that the Commissioners had to determine whether they should extend the right of wearing the white ensign to all yacht clubs seeking that distinction, or whether they should revert to the rule established in 1842 by which the privilege was, for special reasons, restricted to the Royal Yacht Squadron. The latter alternative was decided on, and the blue ensign was substituted for the white. At the time of this affront to the Irish Club there were 130 vessels forming the fleet, and though the club memorialized the Viceroy, the Admiralty, and Parliament, it was without effect, and the privilege was withdrawn. A new club – the Royal Wellington Yacht Club, named after the Duke of Wellington, its patron – was inaugurated on the Thames. The first match was witnessed by a large gathering, and was sailed above London Bridge. Eight small cutters, including Zouave and Emily, competed, and Emily was the winner by 8 seconds. Captain Harry O’Bryan sailed and steered the winner, and prior to the race he had had three days’ hard sailing in Dublin Bay, where Sibyl had won the 100-guinea purse. This yacht was built by Wheeler, and showed excellent qualities in the four matches in which she sailed during the season. A splendid contest took place at the Royal Yacht Squadron Regatta between the two famous cutters Arrow and Lulworth in the Prince Consort’s Cup match, in which Arrow was the victor. Her Majesty’s Cup was won by the Aline, a new vessel built by Camper. 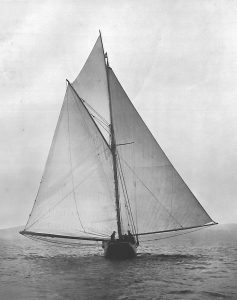 The Aline was designed by Captain C. S. A. Thellusson, and this was her maiden race. She was schooner-built, her tonnage being 216, and she figures in subsequent history as an extremely formidable boat. A new schooner of 121 tons was launched by Mr. Camper of Gosport for Captain W. B. Phillimore, who, in 1859, lost the schooner Alea. Harvey of Ipswich launched the Audax, 59 tons, built for Mr. J. H. Johnston, and she made her debut in the Royal London match from Erith Bay round the Nore. In this race she sailed against Glance and Thought, but she took the lead in a slashing double-reefed mainsail breeze, and held it throughout, though the Thought beat her on her handicap, and she took second prize. She appeared again in the second match of the Royal Thames Yacht Club, and again took and carried the lead, though Glance beat her on her handicap. Audax through the season sailed in twelve matches, in six of which she was successful. At the Royal St. George’s Regatta she sailed a magnificent race against the Surge over a 58 miles course, and though Surge beat her on time, there was only 10 seconds difference. At the regatta of the Cork Yacht Club, however, fortune turned in her favour. There was a strong breeze, and after a slashing contest Audax won the 100 guineas against Surge (2nd) and Aura (3rd). The only occasion on which Audax was beaten fairly on merits was at the Royal Southern Regatta, when the Amazon, an old favourite, romped home ahead; but she was winner of 50 sovereigns at the Weymouth Regatta, and captured a prize at the Royal Torbay Regatta. She was a handsome boat, full of promise, long and low in the water, and an entrance and delivery which were nearer to perfection than anything then in existence. She fully justified the hopes of her owner, though she was not the champion boat of the year. This honour of the year fell to Surge, which won on the West Coast and Irish Regattas the handsome sum of £420. She was a Fife-built boat, owned by Mr. C. T. Couper, and out of eleven starts won eight prizes. Audax won £315 in twelve starts. Three well-known Yacht Club officials died during the winter – viz., Lord Londesborough, Commodore of the Royal Yorkshire; Lord John Scott, Vice-Commodore of the Royal Eastern; and Mr. John Houldsworth, Vice-Commodore of the Royal Northern. The year 1861 opened with a series of most melancholy disasters at sea. The great storm of February 9, which sprung up suddenly on the North-East Coast, accounted for over 300 ships of all sizes and two lifeboats, causing the famous disaster to the Whitby lifeboat, and a similar disaster near Cowes. The loss of life was very great, and the material damage colossal. In spite of these depressing influences, the year ranks as one of the most prosperous in the history of yachting. New boats were added to the already large fleet of fast clippers, new life and enthusiasm was infused into the various clubs, and many new trophies were offered for competition. The advent of America in 1851, when she carried off the Squadron Cup, had led to a remodelling of the old school of designing. Up to then Alarm, built upon the lines of her owner, Mr. Joseph Weld, was the fastest cutter yacht afloat in British waters, but owing to the success of the America Mr. Weld had been induced to convert Alarm into a schooner, and in 1852 these alterations were carried out, and she regained that prestige which was lost in 1851. America, on the other hand, was altered in the British yards, and one authority, who saw her in the Northfleet Dockyard with a portion of her copper removed, states that she was rotten to the core, and that he never expected to see her afloat again. Mr. Pitche then became her owner, and she was renamed Camilla. Steps were taken to rebuild her with sound timber, and innovations were introduced in spars and sails. Her foremast was shortened by 6 feet, her mainmast by 5 feet, and her topmast and main gaff lengthened. Instead of hemp her sails were made of cotton, and the principle of lacing sails along the boom had been superseded by loose sails. These alterations had been made with a view, possibly, to a match between the famous boats, but for a decade they did not meet in any race. In 1861, at the Royal Thames Yacht Club schooner match, a challenge was issued by Mr. Weld for a private match between Alarm and America for £100. The challenge was accepted by America’s owner, and the match was arranged to be sailed on July 31, though the date was subsequently fixed for August 5, the day before the Squadron’s Regatta. The race aroused the keenest interest, and the excitement was almost equal to the excitement on America’s first appearance in British waters. The Queen and the Prince Consort watched the race from the royal yacht, and eighty-four vessels of all descriptions accompanied the match. Alarm was thus winner by 37 minutes 5 seconds, and, of course, the result of the race was hailed with the liveliest satisfaction by those who could not forget the defeat of 1851. She was very cleverly handled, and the win was a triumph for John Nicholls and the owner of Alarm, who had thus altered his famous vessel to beat the Yankee boat – a triumph which he had long desired. But it was no criterion of America’s powers, and it was regrettable that Alarm was not pitted against her before she was altered by English builders, when Alarm could have been backed by 1,000 sovereigns against her. It was generally acknowledged that the Camilla of 1861 was not by any means the America of ten years earlier. She had lost that slippery and piratical appearance which struck yachtsmen with admiration on her arrival in British waters. The handicapping was somewhat curious. Alarm allowed Aline 5 minutes 45 seconds, and Albertine 21 minutes 15 seconds. The Galley of Lornallowed Alarm 6 minutes, Aline 9 minutes 15 seconds, and Albertine 27 minutes 15 seconds. For the next day’s racing for the Squadron’s prize of 100 sove­reigns there was an extraordinary entry of famous boats, including Alarm, America, Arrow, Audax, Aline, Thought, Christabel, Enid, and Phasma. For the Prince Consort’s Cup there were three cutter yachts entered: Arrow (Mr. T. Chamberlayne), Osprey (Colonel W. R. Huey), and Brunette(Mr. A. H. Davenport); and Arrow, after sailing a clever race, won, beating Osprey by 16 minutes. Arrow was at the time still an extraordinary boat. She was designed and built by Mr. Weld thirty years prior to this race, and she was champion till defeated by the Marquis of Anglesea’s Pearl. Then Mr. Weld designed and built the Alarm, and Arrow was laid up on the mud for years. Mr. Chamberlayne then purchased her, and had her planked and lengthened, and from that time she resumed her old position as the undoubted champion, and the only cutter that could be backed against her was the later-day boat Lulworth. Arrow, Alarm, and America were also entered for the Royal Victoria Yacht Club race for cutters and schooners. Thought, Phasma, Audax, Christabel were also entered for the prize of £100, but at the time of the race there was a good deal of dis­puting. First the cutters refused. to sail with Alarm, and the match, as originally intended, fell through. An attempt was made to divide the sum into two prizes of £50 each, to be sailed for by the two classes. However, the other cutters refused to sail with Arrow, and the race again fell to the ground. Finally, it was agreed to sail a race among the cutters, and Arrow was made scratch boat, but she romped home and won handsomely. The three last-named boats were small cutters, and were doubtful starters with such formidable opponents. A way out of the difficulty was found when all the other yachts were withdrawn to provide an uninteresting match for this trio. Earlier in the season Alarm had taken part in the famous schooner match for a prize valued 100 sovereigns, given by the Royal Thames Yacht Club. The course was from Rosherville round the Mouse light, and back to a flag buoy off the Greenhithe. The entries were: Galatea, 124 tons (T. Broadwood); Alarm, 248 tons (J. Weld); Albertine, 156 tons (Lord Londesborough). Albertine was a new boat, built by Inman and launched in 1860, and this was her maiden race. Galatea was built by Hansen of Cowes, and launched in the same year, this being her second match. On the handicap Alarm allowed Albertine 13 minutes and Galatea 19 minutes. Albertine allowed Galatea 9 minutes. The start was made at 12 8 45. In this race Alarm made the shortest time then on record from Rosherville to the Mouse, sailing the 28 nautical miles in 1 hour 57 minutes 45 seconds. After the match she was taken round to Cowes, and there hauled up on the hard. In a letter which her owner, Mr. Weld, addressed to Mr. Hunt, a curious and almost inexplicable revelation was made. He says: ‘On putting the Alarm ashore at Cowes to clean her bottom, we found that the rope, which is called a spring, used in getting the vessel round after the gun had fired for the yachts to start, had got between the rudder and the stern post. This spring is 27 fathoms in length, and was made fast to the hawser which she rode by, and in casting round at the start she broke this 6-inch hawser, which is thrown overboard at the time; but it being made fast to the spring, she towed it the whole way after her in the race. The spring was 3-inch rope and 27 fathoms long. 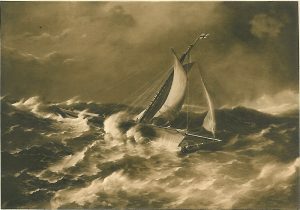 The whole 51 fathoms she dragged not only in the race, but round to Southampton.’ The extraordinary incident caused much comment at the time, especially in view of the fact that Alarm had made a record race, though in light weather she would hardly have been able to move through the water at all. The liberality of the Thames clubs was notable at this time, and the Royal Thames was particularly lavish in its prizes. This club was the richest in funded capital, and did not spare in its efforts to promote the interests of the sport, and to create rivalry between owners and keenness among designers and builders. For the opening races on June 23 an epergne, value £100, was offered and won by Thought, a cutter belonging to Mr. F. D. Marshall, though she was only a second-class boat. Other prizes were the 100 guineas, offered for the race from Gravesend to the Nore, won by Alarm, and numerous smaller prizes of from 50 to 20 guineas. The Prince of Wales Club also offered cups, presented by the Commodore (Mr. R. Hewett) and the treasurer (Mr. A. Turner). The Bessie, a 10-tonner, and the Why Not were winners of these. The Ranelagh also offered two cups, which were won by Little Vixen and Clara. The Royal London offered a silver basket, and Bessie and Why Not with Violet competed in the race. The former boat fouled, and in the arbitrament Why Not was declared winner. The Ranelagh, hitherto looked upon as an ‘above bridge’ club, organized a race from Rosherville to Woolwich on August 1 for two silver cups, which were won by Mr. I. Pick’s Jessica and Mr. D. Hatcher’s Giraffe. Outside the Metropolitan matches the sport showed considerable life, though the East Coast clubs were in a state of suspended animation. The Queen’s Cup of the Royal Mersey Yacht Club was won by Mr. T. Couper’s Aeolus, on a resail. On the first day Thought had outsailed all her competitors, but did not cross the line in the stipulated time, and was debarred from taking the cup. This was Aeolus’s only win of the season. Osprey, a 62-ton cutter, owned by Colonel R. W. Huey, was the most successful prize-winning boat of the year, though Glance, Thought, Audax, and Alarm won handsome sums. Osprey was winner of the Ocean Race from Kingstown to Cork.